Read the how and why about this list from the top of the #10 post, then come back to read about the newest handwheels & Sangean H202 Waterproof Radio. Sangean H202 Waterproof Radio – Why waterproof? Use it in damp and wet environments: Take it INTO the shower, use it in the kitchen next to the sink, take it boating and in the RV. Have no concerns about getting it wet by accident. And use it as an emergency radio that needs no cranking and is always ready. This is the latest edition of the radio that I asked to be built many years ago. I asked Sangean, a highly respected radio electronics manufacturer, to make THE BEST EVER shower radio from my list of specifications. 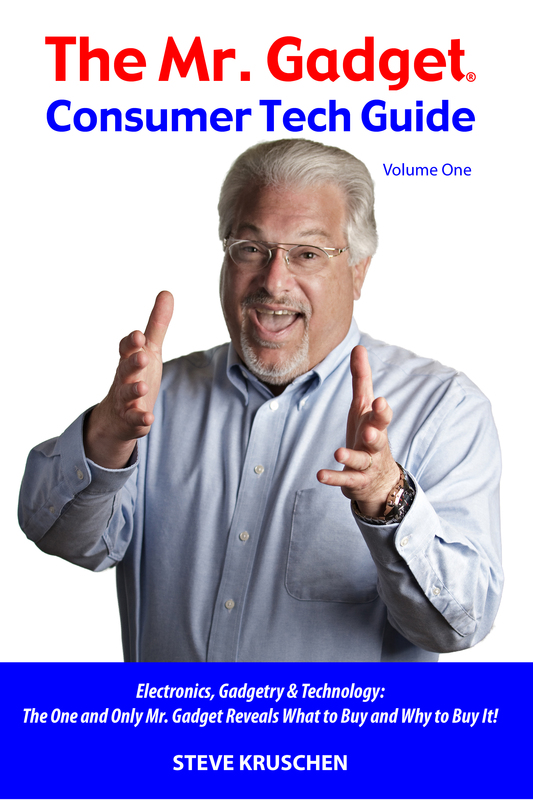 I wanted a big, bright, easy-to-read backlit display, great reception, rich sound, especially for the spoken word (I’m a news and talk radio junkie), and much more. I wanted FIVE presets each for AM and FM, and a sleep timer with multiple time settings. The display also had to show the battery life in very easy to understand bars and the backlighting had to automatically go on with any button push, then off after just a few seconds. I wanted to see the time all the time, except when turning on the radio, adjusting the volume and when the station or radio band is changed or timer functions engaged. At those times I want the to see the new function for a few seconds before going back to the time display (with seconds!) and battery life indicator. Who cares to see the station number or other function once it is selected? We want to see the time, right? I also wanted a short timer that could be used as a general reminder or as a kitchen timer. With shower use in mind, I wanted there to be a loud emergency alert sounder (I forgot my towel or I’ve fallen and need help). Because I’ve lived through extended power outages after earthquakes and other calamities, I wanted a side-firing LED “flashlight” to provide emergency, long lasting illumination, even in the shower. How would you like to be thrust into darkness when you’re in the shower, it’s dark outside and household power is interrupted? Another requirement was that it had to run a long, long time on a set of common, disposable batteries. The H202 and its predecessor, the original H201 (still available), operate well for an amazing 250 hours on a pair of inexpensive and readily available alkaline “D” batteries. Imagine being in the midst of a long power outage or an emergency situation, and having THIS radio as your link to news and information. On the other hand, think of the Sangean H202 as an everyday radio that handily doubles as an emergency radio. Isn’t it understandable that I say this is MY radio? And I received not a penny for any of this. The Sangean H202 is all of the above, and more. This updated version adds Bluetooth, allowing streaming audio from a smartphone or Bluetooth-equipped computer. Stream music from any source through a smartphone and listen to it on the H202. There are many reasons why any AM radio might not be static-free or may not be well received inside the home and especially inside the shower or bathroom. Not only are myriad computer electronics in today’s homes throwing interference that was not present even 30 years ago, but AM radio signals are highly directional. In addition, your shower or bath might not provide an easy way to position the radio in the precise direction for best AM radio reception. 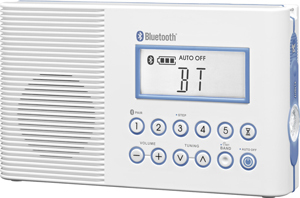 Using Bluetooth, listen interference-free to any radio station’s Internet stream via a smartphone or computer within up to 30 feet of the H202, regardless of the radio’s orientation. Listening to streamed audio through the H202’s speaker also means that in the shower, or anywhere, the sound of that stream will be better, stronger, more room filling through the H202 than through a smartphone or most laptop’s speakers. Listen to your favorite stations streamed from anywhere in the world or from back home in another town or state. 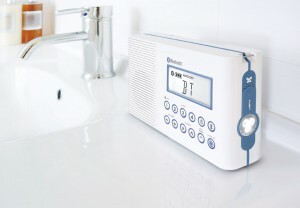 With the H202, users have the choice to listen to local AM and FM stations using the excellent built-in radio tuners or, with Bluetooth, local stations along with a virtually unlimited catalog of all forms of audio information and entertainment way beyond just old fashioned “regular” radio. Listen to podcasts and old time radio, music and more through apps and Websites including Pandora, Songza, iHeart Radio, ooTunes Radio (my favorite, for iPhone only), Rdio, Spotify, and TuneIn, among others. To be clear, content delivered through the above apps AND from most local radio stations is available through computers and smartphones. Bluetooth in the H202 allows this content to be sent wirelessly from a nearby smartphone or laptop to the H202 where it can be enjoyed with bigger, better sound than from most smartphones, and that audio can be easily heard, interference-free, even in the shower, with smartphone or laptop safely out of harm’s way where it is dry. 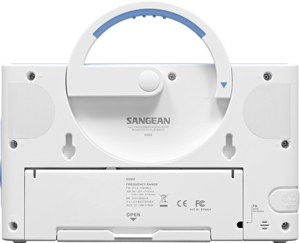 The Sangean H202 radio is an exciting product on so many levels and unique in the world for its quality, features, versatility and functionality. It comes with a bracket and strap for versatile hanging and shower wall mounting. 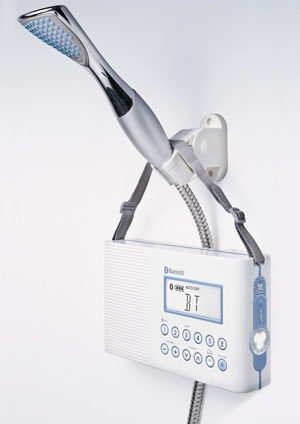 The handle rotates into and out of the top rear of the case to form a handle, another way to secure the radio, such as over the pipe through the wall that feeds the showerhead. I use my H202 (and H201) daily, not just in the bathroom or shower. There are a few in service throughout Gadget Central. Radio is not just for mobile listening while in the car, you know. For more information, visit Sangean. About $85 from Amazon. Sangean H201 (the original design without Bluetooth) is about $65 from Amazon.